I'm not a fan of rainy days, especially here in Paris, as I find myself spending the day taking cover in the warmth of my cosy apartment, only leaving the house to fetch some food and water. 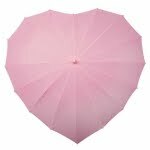 That being said, if I had one of these beautiful heart-shaped umbrellas from Bulle de Style in my life, going out in the wet would be an absolute pleasure. 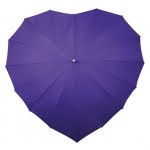 They come in loads of colours, but these are my favourite.